Background: Adnexal masses in premenopausal women are common reason for referral to OB-GYN. The etiologies vary from non-gynecologic to gynecologic. Once the mass is determined to be gynecologic in its origin, the gynecologist needs to predict if the mass is more likely to be benign or malignant which could lead to a diagnostic dilemma. 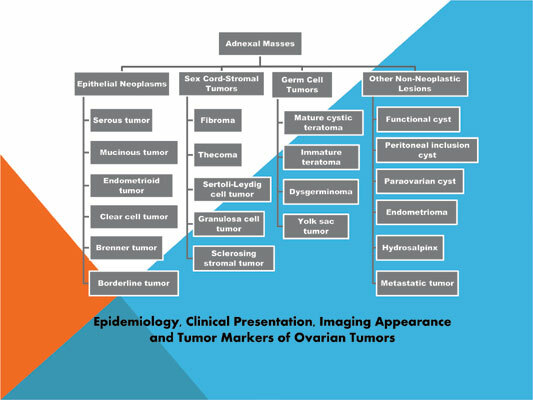 Objective: This article reviews different histologic type of ovarian tumors, its epidemiology, clinical presentation, imaging appearance and ovarian tumor markers. Familiarity with these patterns will help the clinician narrow the differential diagnosis thus facilitating further management. Results: The incidence of malignancy increases with age. Vast majority of adnexal masses that are ovarian in etiology, 90.5% are benign. The first line imaging is usually a pelvic ultrasound. There are imaging characteristics that could assist in categorizing a mass as more likely to be benign or suspicious for malignancy. Furthermore, there are tumor markers that are approved by FDA to be used as tools to evaluate adnexal masses. Conclusion: Adnexal masses in the reproductive age group demonstrate the greatest histologic variance that is mostly benign. Clinical judgement is important to predict if a mass is likely to be benign or malignant based on risk factors, imaging appearances, and tumor markers. If suspicion of malignancy is high, referral to a gynecologic oncologist is warranted as this may improve patient’s survival. Adnexal mass, tumor markers, premenopausal, reproductive, diagnostic dilemma, ovarian tumor.